Kaiseki is an elegantly orchestrated course meal consisting of small dishes served at carefully timed intervals. 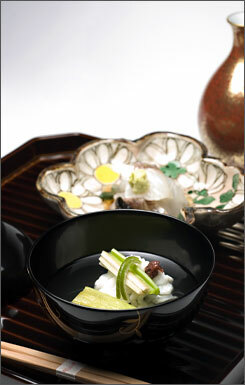 A typical kaiseki menu consists of eight courses. It invariably includes an ornately composed appetizer, a clear soup, sashimi, sushi, a grilled dish, a simmered dish, a steamed course and a dish with rice. The courses are brought in one at a time, in beautiful porcelain bowls and lacquer dishes. Kaiseki enjoys a beautiful 500-year-old history rooted in the Zen monasteries of ancient Kyoto. Named for the warm stones that young monks carried in their robes to help soothe their hunger (kai means bosom, and seki, stone), it evolved from a light meal into an artistic event with an exquisitely choreographed tasting menu.